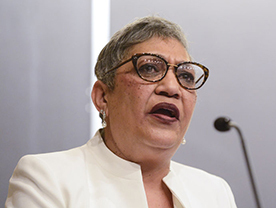 Reverend Sharon Washington Risher was catapulted into the limelight after the Charleston, South Carolina shooting at the Mother Emanuel African Methodist Episcopal Church on June 17, 2015. 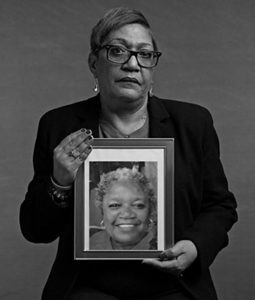 Her beloved mother — the church’s sexton — Ethel Lee Lance, was killed along with eight others, including two cousins and a childhood friend. Since that horrific tragedy, Sharon has been very outspoken about the nation’s gun laws and is one of the national spokespersons for the grassroots advocacy groups Everytown and Moms Demand Gun Sense. Audiences nationwide are saying that Reverend Risher’s talks are incredibly powerful, emotional, riveting, raw and authentic, and each of her talks cover her personal experience losing loved ones to gun violence, race, racism and hate in America, as well as the path to forgiveness and an offering of hope for tomorrow. She has appeared multiple times on CNN, and was interviewed by Time Magazine, Marie-Claire, Essence, Guardian- BCC radio, among others. She visited President Barak Obama at the White House on several occasions, and has been a guest speaker for several Martin Luther King, Jr. memorial events. The Charleston, South Carolina native was graduated from Charles A. Brown High School and from Johnson C. Smith University, in Charlotte, North Carolina. After discerning a call to vocational ordained ministry in 2002 while attending St. Paul Presbyterian Church in North Carolina she relocated to Austin, TX where she later received a Master of Divinity Degree in 2007 from Austin Presbyterian Theological Seminary in Austin, Texas. Reverend Risher worked in hospital chaplaincy for several years, most recently as a staff chaplain and trauma specialist, with Parkland Hospital of Dallas, TX. Today, Sharon is traveling the country as an activist and speaker, and is working on writing a book. Sharon’s book, For Such a Time as This, Hope and Forgiveness after the Charleston Massacre – published by Chalice Press – is set to be released in June 2019, coinciding with the four year anniversary of the shooting.